. Emotions and Matsuo Basho 松尾芭蕉 .
. Emotions and Kobayashi Issa 小林一茶 .
. Emotions and Yosa Buson 与謝蕪村 . Strong emotions like melancholy or sadness (kanashisa 悲しさ) and others are usually not used directly in traditional Japanese haiku, which tend to simply describe the scene but not interpret it in human terms. A suitable KIGO is used to bring out the underlying mood / emotion of the haiku. the emotional part is expressed through the skilfull use of kigo. Each kigo has an emotional mood, which gives the author the opportunity to convey his emotion without saying "I am sad", "I am happy" openly. The emotional background is explained in the saijiki and needs to be learned, just as we learn the vocabulary of a new language to be able to speak it properly. Children are usually taught to imply the emotion within an appropriate KIGO, as I have experienced it in our local grammar school. There are however exceptions from these guidelines (yakusokugoto), as we will explore below. These emotional words are usually used in context with a season word. The composing of a Japaese haiku depends first and foremost on the situation experienced by the poet and his choice of vocabulary or style which suits that situation. How does one produce work on negative subject matter such as loss, anger, melancholy. Its not that I am a pessimist, its just I want to know if haiku cover the full the range of existence. Absolutely -- all flavors of experience have been approached through haiku. However, as with any emotional content, dark emotions need to be evoked indirectly, by choice of words and images. very strong emotions tend to be hard to express well in these subtle ways, and probably do not make good subjects for haiku. but there are plenty of examples of sorrow, loneliness, regret, and nostalgia being conveyed beautifully by way of the observations being made of "external" things. The beauty of Japanese haiku poetry, inspired by Zen Buddhism, lies in the brevity of expression which conveys a world of meaning and emotions. "Loneliness is the second state of mind necessary for the creation and appreciation of haiku. Loneliness is also a state of interpenetration with all other things." What quiet loneliness fills the autumn air! Standing motionless before the river at twilight.
. Ryookan 良寛 Ryokan (1758-1831) . of loneliness . . .
of my solitude . .. This haiku has the cut marker KANA at the end of line 3. Joso (Joosoo) lived as a Zen monk in a remote small hut and might have felt this endlessly falling sleet as falling right though the bottom of heaven on his reed roof and onto his cold body. He felt the powerlessness, weakness and loneliness of his own body and personal situation even stronger. "through the bottom" is an expression of his humor on this bleek cold day, since there is nothing he can do but yield to his miserable situation and write poetry about it. He died at the age of 43. He wrote this for his son, who was jsut 3 years old and always playing alone. After the first frost has come, the flowers are withered and the seeds have fallen to the ground.. Compared to the lush green of summer, this view gives rise to "aware". The point of this haiku is the expression "aware o kobosu". I first translated asamashi as "pitiful," but for a different haiku in which this word appears, Shinji Ogawa suggests, "shameful," as a better translation. In snow country like Issa's home province of Shinano, certain kinds of trees must be protected by columns placed under every branch to prevent the branches from being broken by the weight of the snow. Shinji explains that Issa is playfully teasing the old pine: "Shame! Shame! How many canes are you using, old pine?" "thrusting in my hands I noticed/ the urn water"
(te o irete shiru/ kame no mizu). Drawing water, I noticed the tepidness yearning for the olden days . .
Shinji notes that Issa's use of the word shiru (notice) is a conscious reflection of Basho's statement. 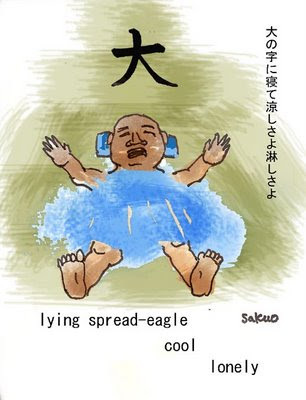 Japanese double negatives are often best translated as strong positives in English. For example, what can be literally translated as "don't dislike" actually means "to love, like a lot, have special feelings for" in English. Classical Japanese was fond of understatement, and experienced readers knew from the context when to read double negatives as strong positives. If double negatives are translated literally into English, readers have fewer cues, so in many cases, such as the present hokku, written by a poet who himself does not hate crows at any time, a strongly positive translation seems justified. The implication in the hokku seems to be that even those who usually hate crows must be satisfied with the birds, at least for the time being. And Issa's own opinion seems to be that the crows are very likeable indeed.
. Full comment by Chris Drake .
. urayamashi ukiyo no kita no yama-zakura . In the Edo period, this word was also used for the first haiku meeting and print-out of their latest haiku to had to friends. SABU, means also "getting rusty", autumn is rusting. It may also hint to the color of the autumn leaves. Issa and more haiku about loneliness ! Temari uta is a song that Japanese children sing to count while bouncing or catching a small ball ten times, each time saying the name of a deity or famous temple or shrine. my husband has to go to war and might not come back ! I cry and cough blood ... hototogisu! More links about the wonderful TEMARI balls. kigo for the New Year ! This haiku needs an introduction about the poet's parting on September 23, 1943 when he got his draft card notice. He then thought of his family and friends who remained behind. In the evening sky, a flock of wild geese were flying and honking and then disappeared. It seemed to echo Hakyos sad feeling and his determination to deem, everything that remains as beautiful. This shows his affection toward everything that remained: the value of family and friends - and that love becomes more beautiful when it ends. His sad feeling is embodied in the image of the departing wild geese.
. Ishida Hakyo (Ishida Hakyoo)石田波郷 . omoshiroi, おもしろい (面白い) can have many nuances in Japanese, according to the situation.
. MORE haiku with emotions . Evidently, wildflowers are blooming in the grass. Japanese fishermen use cormorants. Tied to a tether, these sea birds dive for fish that they are forced to disgorge. Shinji Ogawa has helped to untangle the syntax of Issa's original. Ku no shaba ya: "painful (or afflicting) world..."; sakura ga sakeba: "if cherry blossoms bloom"; saita tote: "because of the blooming." He paraphrases: "painful world.../ if cherry blossoms bloom/ because of the blooming (the blooming adds another pain)." He comments, "We Japanese smile at Issa's twist to associate the blooming of cherry blossoms with pain." world of pain-- and blossoms blooming add to it! "Heaven's River" refers to the Milky Way. Issa is happy to find it even in this backward province far from the capital. Aisoo or aiso denotes amiability, affability. These English equivalents sound too cold for this context; I hope that "lovely" expresses Issa's warm and tender feeling toward the young grasses. EXPRESSION OF EMOTIONS IN THE INTERNATIONAL / MULTILINGUAL HAIKU OF BAN'YA NATSUISHI. - Adam Donaldson Powell, 2009. Some old-fashioned "experts" still insist that human emotions in haiku are only to be expressed in figurative ways through depictions of nature, while others are venturing into somewhat more obvious analogies. I - myself - am a bit wary of the pitfalls of falling prey to reading too much into the subtleties of haiku, or to limit the usage of such expressions of subtlety to Japanese culture and tradition. There are many opinions circulating regarding the mechanics and functions of haiku-writing, as well as some individuals who would seem to maintain that the only good haiku-writers are those who follow strict Japanese tradition. As I have written elsewhere, contemporary haiku - and perhaps especially international haiku and haiku adaptations into other languages - must address many cultural and linguistic differences that may challenge traditional Japanese rules regarding classical haiku, including but not limited to meter, linguistic and culturally-associated rhythms and sounds of words employed, expansion of time beyond "the moment" etc. "[Nevertheless,] not many Japanese Haiku poets have been open to foreign experiences ... The main reason is their idée fixe about nature ... This situation has effectively prevented Japanese haiku poets from looking at a foreign land from a non-Japanese perspective. Foreign landscapes remain largely alien and incomprehensible. "More than three hundred years after Bashô, I am trying to create in my haiku diverse, astonishing traditions and phenomena of the whole world." It occurs to me that the cultural associative expertise required in international haiku and haiku in translation is perhaps especially significant in regards to communication of emotion - both viscerally and figuratively. While classical Japanese haiku expresses emotions more figuratively than directly, modern forms of haiku and international / non-Japanese haiku forms would appear to be experimenting with and stretching the "old and the traditional" into more "liberal" expressions of emotion and usages of kigo. Ban'ya Natsuishi is classically-schooled and does employ many traditional Japanese forms in his haiku-writing, but he is also constantly exploring the haiku in literary evolution. His work with World Haiku presents special challenges and many new possibilities in regards to the internationalization of contemporary haiku-writing. It is my premise that expression of emotions in art is not merely a question of perspective of nature, but concerns color, form, verb form, sound, meter and time as well. In the above examples Natsuishi plays with the "rules" most creatively, experimenting with time ("a future waterfall"), direct and less direct references to emotions, sometimes more liberal approaches to the usage of kigo, and purposeful liberation from 5-7-5 meter in favor of culturally-effective adaptations in English, Spanish and French (I cannot comment on other languages which I do not understand). Successful adaptation of haiku from Japanese (or another language) to other languages is not merely a question of cultural and linguisitic translation but perhaps also entails a oneness in expression in the original language that at times surpasses literary and cultural norms in the mother tongue in order to achieve a more universal expression. The ability to successfully make creative decisions depends on the artist's understanding of tradition (where artistic expression norms have hailed from) as well as the understanding of how to employ intentional techniques to achieve desired new forms of expression. Decisions regarding usage of meter, form, sound, suggestion, time, length etc. should be conscious and intentional, and yet give the appearance of evenness and technical ease and dexterity. A technically or emotionally difficult passage in a work of music, literature or art should appear as effortless in execution as a technically or emotionally easy one. Here Ban'ya Natsuishi unabashedly shows his mastery of artistic execution and suggestiveness and his intelligence in decisionmaking and planning -- resulting in a natural feeling recognizable by readers from various cultures, traditions and in many languages. Despite his intellectual and technical expertise, Natsuishi has loftier goals than merely to find new ways of expressing emotions. He says himself: "My concern is not expressing emotion in a new way, but something deeper than emotion is my target." Instead of appreciating the willow like a typical haiku poet, Issa complains about it. Is he standing outside looking at the house, annoyed at the way the tree obstructs his view of it, or is he inside the house, looking at a blocked window? Either way, he finds the tree utomashiki: disagreeable; Kogo dai jiten (Shogakukan 1983) 216. Note the fun that he has with k-alliteration in this haiku: kata kabe kakusu. This hokku is from the beginning of the fourth month (May) in 1819, when Issa was living in his hometown with his wife and baby girl. According to Year of My Life, on 4/16, soon after this hokku was written, Issa set out on a journey to retrace the travels of Saigyo and Basho in the northern regions in order to improve his haikai-writing ability, but he soon turned around and returned to his hometown. There is no mention of this terminated journey in Issa's diary, so it may be a fictional allegory written to suggest that in his case his narrow road to the north was his narrow road to his own hometown. At this time Issa was experimenting energetically and creatively as a writer, and this hokku may be a further expression of the larger ferment that was going on in his mind. Issa's hometown is in a rather high, cold area, and bush warblers return rather late, so the songs of some of the males (known to ornithologists as plastic songs) are still rather ragged. The most striking bush warbler song is sung by males in their strong warbler voices, often as they fly around the edges of their territories, turning away other males and trying to invite a female to come inside. After the mating season finishes, however, the males stop singing their song until the next mating season, and many of them have to practice hard at the beginning of each new mating season to regain their ability to sing their fairly complex song. At the same time, many young male warblers are trying hard to copy the songs of their fathers and of other adult males and learn the song. The warbler in the hokku could be either mature or young, but Issa can hear the bird from a distance, so perhaps it is a mature male struggling to regain his ability to sing. Issa says the warbler is singing poorly or badly. By this he probably means the warbler is still singing in fragments and is not yet able to sing the whole song fluently. For example, a full verse of the bush warbler song goes, according to Japanese onomatopoetic notation, something like pi pi pi kekyo kekyo hoo hokekyo hoo hokekyo, together with some slides and flourishes, so the warbler Issa hears might be singing something like hoo hoo kek or hoo hoo kekkyo kekkyo or another fragmented variation. Probably the modulation and the length of the individual sounds are still abnormal as well. Issa doesn't say why he loves to hear this song practiced again after a long silence of many months, but surely the sound means more than just the return of warmth to the village. One possibility would be that, since the crescendo of the main call of the warbler sounds similar in meaning to "Lo, Lotus Sutra!" in Japanese, Issa might be impressed and encouraged by the thought that nature is also striving to improve and to sing the praises of the Lotus Sutra. Another possibility would be that he loves the passionate way the warblers keep on repeating various individual song elements and listening to other warblers do the same until they have finally have mastered the whole mellifluous song together, though with individual variations. The song-learning (and relearning) process might have suggested, at least in a way, a great avian renku fest that paralleled what Issa and other haikai poets in his network were doing. Or what Issa was doing as he began vaguely thinking about putting fragments of a whole year together in a haibun and hokku montage. In any case, it seems likely that the warbler Issa hears in this hokku reminds him of how much he has grown since he first heard warblers struggle to learn their songs as a young boy in his hometown and also reminds him of how much better he needs to become as a writer and "singer" in the future.